Red hibiscus is an evergreen arbor and is often called "the big and red flower" by common folks. It has a beautiful shape, and its branches and leaves are exuberant; the flower abloom all the year round, the flowers are large and their color is bright; it is no doubt one of the most important forestation trees in Asia. Red hibiscus is the national flower of Malaysia and Panama, as well as the state flower of Hawaii, but its native land is China. 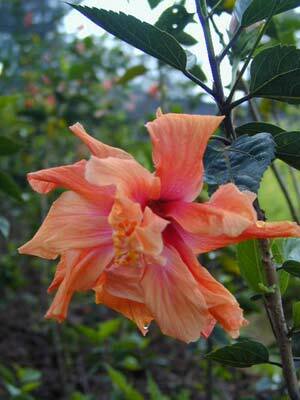 China has a long-standing history for planting red hibiscus. There are records for it in an ancient Chinese book entitled "Records of Mountains and Seas" and it says "red hibiscus trees are planted in Tang valley", and also records in another ancient Chinese book "Plants in South China" and it says: "the flowers of Red hibiscus are like those of wild cotton, and are in deep red" etc. There are many varieties of red hibiscus. We can divide them into single-pedaled and double-pedaled types according to the pedals; and we can also divide them into red, yellow, green and white red hibiscus according to the color of the flowers. Of all the flowers, the deep red one looks like peonies. Since it is a rare variety, people often call it "wild cotton peony".